Fopark is a next generation parking solution that provides real-time occupancy information for parking decks and outdoor surface lots. Everyday, motorists around the world are circling crowded parking lots looking for an open spot, wasting valuable time and fuel. FoPark is a next generation outdoor parking solution that provides real-time parking availability information to motorists so they can plan their commute ahead of time. Our solution determines occupancy using machine vision and machine learning technologies by parsing live streams of data from security cameras installed in parking lots. This occupancy information is then presented real-time to commuters through our mobile parking guidance app or digital signage. Our FoPark data analytics solution provides smart parking management with precise information on lot usage, peak occupancy times and average occupancy information. 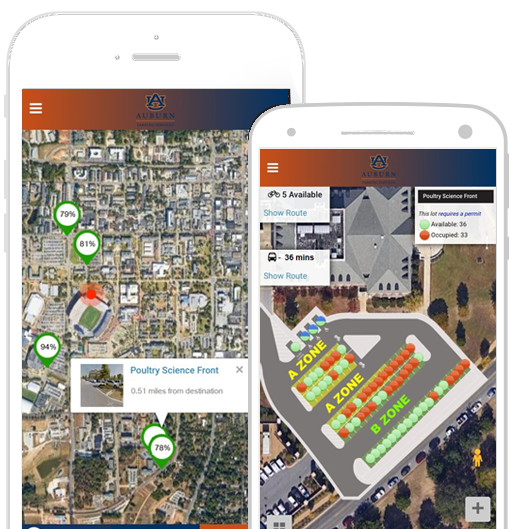 For cities, universities and shopping centers, our smart parking app enables parking managers to effectively manage busy lots, manage traffic flow, increase usage to underutilized areas, and increase overall efficiency. FoPark puts the control back in the hands of the parking lot owner or parking manager, allowing for improved efficiency and real-time pricing changes based on occupancy, all through a simple mobile app. FoPark’s intelligent system records information regarding when the car was parked in a spot, how long was it parked and when it left the spot. This data is presented to the users in the mobile App and the website in an intuitive and easy to use layout. FoPark puts the control back in the hands of the parking manager/owner allowing for effective management and maximum utilization of all parking facilities. FoPark puts complete control in the hands of the parking lot owner or manager, allowing for improved efficiency and precision monitoring of how a lot or deck is being utilized. Better Commuter Experience – FoPark’s smart parking platform provides commuters with real time data to help guide them to available parking. This allows commuters to spend less time searching for parking and more time enjoying the downtown area. Reduce Downtown Traffic – Statistics show that a significant portion of downtown traffic is caused by commuters looking for parking spaces. FoPark helps reduce congestion by notifying commuters ahead of time where parking is available and, more importantly, where it is not. Increase Operational Efficiency – FoPark’s data intelligence solution provides precise analytics like space usage, peak occupancy, and average length of stay. This data can be utilized to justify construction of new parking assets, drive budgetary decisions, or just provide a better understanding of the city’s entire parking operation. Increase Downtown Commerce – Parking managers can create a higher turnover around high traffic and retail areas by setting time limits for these premium parking spaces . FoPark’s enforcement portal generates violation alerts for spaces with overstay cars and sent directly to the enforcement team. This intelligent enforcement encourages higher turnover in these areas and encourages long term commuters, retail employees, and residents to park in long term lots. Safer City – FoPark’s camera based system also serves as a comprehensive security system that shows residents that their city is investing in a safer downtown. The system is a constant visual deterrent to crime and allows first responders to see what is happening before they arrive to the scene. Real-Time Parking Availability – Provides zone specific parking availability information in real time on a mobile app. Students and faculty can filter specific zones and find an available space to park in their authorized zones. Navigation – Provide space availability for a lot/garage close to their destination and driving directions to the selected lot/garage. Public Transportation Information Integration – Provide real time bus and bike share information corresponding to the selected lot and turn by turn walking directions to bus stop/bike hub after the car is parked in a lot. Dashboard – Provide analytics and data intelligence on the parking assets. Surveillance Security – System provides real time parking occupancy data-, but alsos act as a comprehensive security system covering every single car in the parking lot. Better Customer Experience – FoPark’s smart parking platform provides customers with real time data to help guide them to available parking near the store they want to visit in the shopping complex. This allows customers to spend less time searching for parking and more time shopping. Spot My Car – FoPark lets user save their car location when they park, so that they could easily get back to the right location. Safer Shopping Center – FoPark’s camera based system also serves as a comprehensive security system. It is a constant visual deterrent to crime and allows first responders to see what is happening before they arrive to the scene. Increase Operational Efficiency – FoPark’s data intelligence solution provides precise analytics like space usage and peak occupancy. This data can be utilized to justify expansion, drive budgetary decisions, or just provide a better overall understanding of parking operations and as well as key shopping parameters like average length of stay of customers. FoPark can provide occupancy solutions at a fraction of the cost when compared to the rest of the industry. We will work with you to create a pricing structure that is flexible and will meet your budget. Please contact us for a demo of our solution and a quote. Contact us today to assess your current parking environment and parking needs. We will partner with you to create a comprehensive parking strategy and a cost effective parking solution that meets your budget.